• Tallulah the Lonely - An account of Tallulah by Robert Temple, one of her helpers. • The Internet Movie Database: Stage Door Canteen - Full video of Stage Door Canteen staring with a performance by Tallulah. Free but commercials every 10 minutes. • YouTube: I'll be Seeing You - Tallulah Bankhead sings "I'll be Seeing You" while Fred Allen & Jack Carson converse. Tallulah is accompanied on piano by Meredith Willson. The Big Show, February 18th 1951. 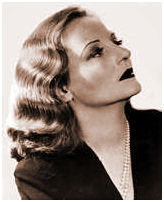 • YouTube: Laugh - Tallulah Bankhead's Amazing Laugh!